On a glorious sunny August afternoon, a group set off from Donegal Town on an adventure to see the Sliabh Liag Cliffs, the highest sea cliffs in Europe standing 600m (1972 feet). Having viewed the breathtaking cliffs from the top, it was now time to see them from the sea. Many would agree that seeing the majestic cliffs from the sea is an even more stunning view, as they rise up out of the water to provide nesting grounds for the many sea birds in the area. The group chose Sliabh Liag Boat Trips owned by local skipper Paddy Byrne, as their means of transport and tour guide to the cliffs. Sliabh Liag Boat Trips depart from Teelin Pier on the North side of Donegal Bay and there are two boats available for a variety of trips including angling, sightseeing, diving and more. There is also the possibility of spotting whales or dolphins on this route, a simply amazing sight to behold. On this particular day the group boarded the Nuala Star which is a 36 foot, purpose built passenger boat with a top speed of 18 knots. The boat is also licensed and insured for 12 passengers. The Nuala Star has the latest safety, navigation and fish finding equipment, combined with Paddy and his co-skipper Kevin’s inside knowledge, this really is the best way to find the top local spots for the trip. Paddy Byrne has over 20 years experience in commercial fishing, leisure angling and in the off shore industry. Paddy is passionate about his tours and does everything possible to ensure that visitors have a great day out. Whether you are on a hen or stag party, a fishing trip or wish to dive in the clear blue waters below Sliabh Liag, then Paddy is the perfect tour guide for you. He is also a Sea Safety adviser with the RNLI and a powerboat instructor who teaches classes at the end of the season. The group departed from Teelin Pier at 4pm and looked forward to trying out some sea angling in addition to sightseeing. With shoals of mackerel flipping and dancing on the surface of the waters as the boat departed the pier, it was clear that this fishing expedition would be certain to deliver a fine catch. There is a catch and release policy depending on the size and breed of the fish on the Nuala Star with the exception of some fish that make it to the dining table. Kevin was skipper for the day and told the group that they have plenty of hard ground for bottom fishing, and spinning with light rods works well over the reefs for Pollock. At certain times of the year anglers target blue sharks and blue fin tuna, and have caught some over 100lb. All sharks and blue fin tuna go back to the sea unharmed. The group caught and released an abundance of fish and were able to see great varieties in each catch. 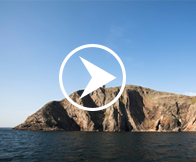 The Sliabh Liag cliffs themselves offer exceptional views over the sea, but looking at them from the sea makes you really appreciate the scale and grandeur of this natural wonder. Kevin told us the sheep that grazed on the steep inclines of the cliffs belonged to his father and that he could trace his family ancestry back over 250 years in the area. The cliffs are steeped in history having a number of look out points that were used during war time. There you will also find the remains of Ade mc Bric’s chapel still and the ruins of the monk’s stone dwellings or bee hive huts. 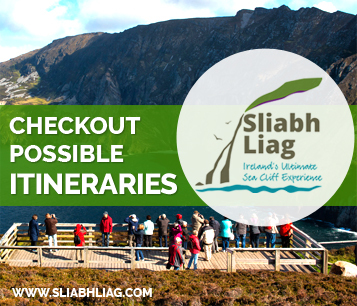 Next time you find yourself on the road to Teelin and are looking for an exceptional and memorable day out, then call Paddy Byrne and join him on a Sliabh Liag Boat Trip that you will never forget.